In my last post, I wrote a bit more about medications. As all of you know, the medications help with symptoms, have many side effects (some that are identical to Parkinson’s symptoms, and some that are often mistaken for Parkinson’s symptoms), and never have cured anybody from the disease. In fact, their purpose is to assist with symptoms…that is all. Current Parkinson’s “treatment” is management of the disease. If you want to be cured of Parkinson’s, you have to realize that you are your own cure. Yes, the Parkinson’s Recipe for Recovery&#0174 is your road map of a cure, but you have to do the Recipe — this means that you are your own cure! Being responsible for being your own cure is daunting for some people. We have become reliant upon others to “cure” us from our maladies, so when the others say, “There is no cure for your Parkinson’s,” what other choice do we have? We either accept what the others say that we cannot be cured, or we say, “I refuse to accept the status quo. I have the power to heal myself…and I will!” This make you your own cure. 1. When my mother died two-and-one-half years prior to me getting the disease, she was mostly in a wheel-chair, had a nurse-caregiver as well as my dad as a caregiver, and she had lost her mind to the medications three years prior to losing her life. 2. The medications had taken my mother’s mind, and they had not prevented her from reaching wheel-chair-bound physical disability. 3. The liver was deeply malfunctioning as well as the kidneys. With all of this in mind, I knew medications were not for me. That was my choice. My fear was not Parkinson’s. My fear was not creating my own path. My fear was the known path…my mother’s treatment path, which is the current medical standard treatment path for Parkinson’s. So, I sat down with Sally. I outlined my treatment plan (the Recipe) and told her I knew I would fully recover. However, I did add this to the conversation: “Even though I have complete faith and I know in my heart I will recover some day, if I am wrong and the doctors are right, then at the end of the path, I think I will be completely paralyzed.” Sally’s response was instant, and it was simple: “It is just a body. You won’t lose your mind like your mother, so I won’t lose you. If you can tolerate what the disease dishes out to you, I am all in.” And off the cliff we went into the abyss. That was nearly four years ago. I share this with you so what I am going to tell you next will make sense. With Plan A only, I was forced to see the silver lining in every cloud. That was not my normal way of being. However, the normal-way-of-being-Howard is the guy who got Parkinson’s, so thinking and acting outside of what had been my norm seemed like a good idea. I recommend it to all of you. I think you get the point. Everything was “great!” Why? First, because that is exactly what was happening in my body. Second, because even if it was not exactly what was happening in my body, I had Plan A only, no Plan B, so fear of Parkinson’s was a luxury I could not afford. I forced myself to find something “great!” about whatever was going on. In the end, I must have been correct…apparently, there was nothing to be afraid of and everything that was happening was “great!” I was my own cure. Here is the mind I had to lose. I had to lose my Adrenaline-mode mind. I had to lose my I-need-to-do-everything-perfectly mind. I had to lose my I-need-to-be-in-control mind. I had to lose my you-are-not-worth-it mind. I had to lose my It-is-not-okay-to-like-yourself-or-love-yourself mind. When I lost that mind, then, and only then, did I completely come to my senses. The whole world changed. Actually, all that had changed was me. I started viewing the world from my heart, and there I have stayed. Each and every one of you has it within you to cure yourself. Challenge yourself or make it a game — focus on positive thoughts, focus on silver linings. If you do this, you will begin to feel it. Once you feel it, you will realize how good it feels. Once you realize how good it feels, you will want to do it again and again and again. And then, one day, you will awaken and say, “Wow, I must have been correct…apparently, there was nothing to be afraid of and everything that was happening was “great!” I was my own cure.” That will be a day you will remember forever. The Parkinson’s Cure. Be it! Thank you, Howard….yes, losing my mind is my biggest challenge…and as you noticed within yourself, the mind can be full of fiction…”not good enough” being a dominant theme for me. It’s sad for me to imagine so many of us struggling through similar mind chatter. Yet I know truth and reality lie within my heart. Through your leadership and support and that of our community as we share our journey together, I am beginning to trust this knowing, and therewith trust myself. This PD adventure of mine is a beautiful, often physically challenging journey traveled with tortoise-like precision, optimism and frequently joy. I am so very grateful for my life. brilliant Howard. i loved every single line. So true Howard. I look forward to losing my mind with your support. I know that I am already learning how to view the world through the heart . Thanks so much. You and your wisdom are real gifts to the Universe. We of this Universe are most thankful! Thank you, Howard. This is exactly the challenge I face every day…every anxiety producing event. I laughed out loud at your list of the various minds we all need to loose! I can relate to every one. Thanks Howard. All these responses to your post reflect my feelings exactly! I will not live a water-colored life or be the muted note! I will dance with my darling wife again. I am the cure I am the cure I have the power …Thank you Howard and Sally, Angels of the Healing Path! Well said, Joseph! Thank you for sharing! Thank you Howard and each individual in this little community. You give me hope and make me smile. When fear raises it’s ugly head, and I get discouraged , I say to myself………. “What is the alternative and how much more proof in the recipe do I need????? ?” The recipe works and it’s hard to argue with fact! Thankyou Howard for your never ending support and encouragement!!!!!!!!!! A big hug and grin to our fearless leader… I am ready to give up PD, but wouldn’t give up having had this disease, the amazing lessons I’ve learned and meeting Howard. Thank you Howard, you’ve given me hope and a belief that I can beat this challenge. Thank you , Howard, for the beautiful post, and the inspiration your example provides. Of all the important statements and wisdom imparted above, I want to comment on “with Plan A only” and “I had plan A only, no Plan B”. This describes how Howard approached his recovery and describe my commitment to the Recipe for Recovery also and how I followed it to full recovery. As I read the post, I felt like I wanted to underline those words because they resonate so strongly with me. 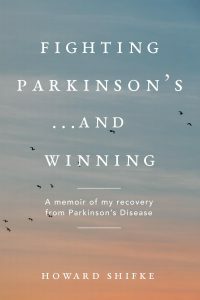 When I did research on Parkinson’s , I wasn’t sure which sounded worse, the disease itself or the end results of the only treatment models I could find. I remember very clearly saying “I cannot do this,” when confronted with traditional treatment. There was no way I was going down that path. When I found Howard and The Recipe for Recovery, I knew this was IT for me. It was my one and only Plan. And since it was my only plan, it was pretty easy for me to stick with it..to “do it conscientiously and at least once daily” , to quote Joseph. I followed it with dedication. If there were parts that I didn’t feel like doing, I assumed avoidance was just pointing out to me the things I probably needed most and instead of cutting those elements out, I focused more on them. Was up. So up I climbed as if my life depended on it and guess what?? I made it! Thank you, Joseph McEleavy, for sharing your heart by way of your 2009 writings. Your words bypassed my mind and went straight to my heart. I have experienced and/or felt pretty much everything you have and actually seeing it in print brought me to tears. Also makes me aware, once again, we are not alone on this journey. I loved your climbing story, Mayarita. I am grateful for all the comments. What a wonderful, loving community inspired by Howard and each other. after reading all these posts, I am speechless…..heroes, all. i’m not at the point yet where I can say i’m thankful I got Parkinson’s but, i’m thankful to read from all these precious people, which would not have happened if I didn’t have it…. thank-you, thank-you, thank-you….can’t say it enough.